designs of Heartwood Creek also won Holiday Decor of the Year. of Santa Claus in the early 1990s. tabletop, lamps, clocks, birdhouses and other home decor items. 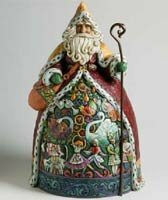 artist to create this unique and creative collection for Enesco. The sesonal and patriotic themes are amongst the most popular. characters. As with Heartwood Creek the range is also from Enesco. indelible part of US national heritage. from the new Disney Traditions range. the public and within the collectibles and gift industry itself. become popular in the future as ranges are ended and retired.